And now the box office starts to get interesting. After a few foregone conclusions making most of May a fait accompli, we start to get into some films where their fates seem genuinely in doubt. Leading the way this weekend is Kung Fu Panda, the first truly animated film of the season (Speed Racer almost counts, but not quite). It's a quasi-spoof of the kung fu genre, with the five major styles of kung fu represented literally by their animals; Tiger, Crane, Viper, Monkey and Mantis. Add to these, the Panda (voiced by Jack Black), who while the laziest animal in the forest, still dreams of being a kung fu master someday. After the escape from prison of a villainous snow leopard threatens the peace of the Eternal Valley, an ancient scroll points to the panda as the one who will save them all, which wouldn't be a problem, if only his kung fu wasn't hopeless. Can he be trained in time to develop his own style to save them all? 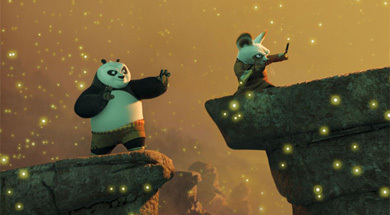 Kung Fu Panda looks like gleeful chaotic fun, in a sort of Looney Tunes meets Jackie Chan (who, not so coincidentally voices Monkey) kind of way. A lot will depend on your general tolerance of Jack Black, who does seem a lot more so as just a voice, especially in the guise of a cuddly panda. The cast also includes a host of famous voices, including Angelina Jolie, Dustin Hoffman, Seth Rogan, Lucy Liu, Ian McShane and David Cross, though you'd be hard pressed to identify any of them from the clips – it's Black's show here.